Nintendo is bringing out some retro games for the new year on the e-shop. I haven't played either game or have any interest in either game but to his /her each own. 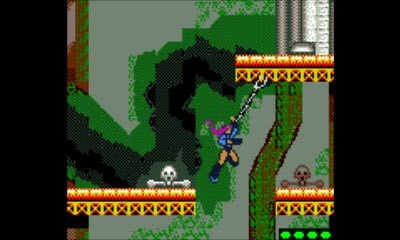 Virtual Console on Nintendo 3DS Bionic Commando: Elite Forces – You are the perfect combination of man and machine – a Bionic Commando equipped with a Bionic Claw that will be extremely handy when infiltrating the danger zone. Blast through enemy lines as you grapple, swing and scale more than 20 levels of forests, deserts, mountains and futuristic cities. You are the last hope in saving your homeland from utter destruction. Suit up, soldier! Virtual Console on Wii U Pokémon Pinball: Ruby & Sapphire – Much more than a regular pinball game, Pokémon Pinball: Ruby & Sapphire combines fast flipper action with a unique way to catch your favorite Pokémon. Control the flippers to shoot the Poké Ball at targets on one of two PlayFields. Play on either the Ruby or Sapphire Field to rack up as many points as possible. The game lets players catch more than 200 Pokémon and features characters from the Pokémon Ruby and Pokémon Sapphire games. Nintendo eShop Must-Haves Start the new year off right in the Nintendo eShop, which features must-have classic and current games. Check the Nintendo eShop each week in January (from Jan. 1 at 9 a.m. PT until Jan. 29 at 8:59 a.m. PT) for Nintendo eShop Must-Haves – they’re the perfect way to build a collection of great games that you can enjoy for years to come. Nintendo eShop on Wii U and Nintendo 3DS Shovel Knight on Wii U and Nintendo 3DS is 33 percent off until 8:59 a.m. PT on Jan. 8. Nintendo eShop on Wii U Unepic is 30 percent off (reduced from $9.99 to $6.99) until 8:59 a.m. PT on Jan. 29. Nintendo eShop Nintendo 3DS Dress to Play: Cute Witches! is 50 percent off (reduced from $3.99 to $1.99) until 8:59 a.m. PT on Feb. 1 Dress to Play: Magic Bubbles! is 50 percent off (reduced from $3.99 to $1.99) until 8:59 a.m. PT on Feb. 1 In addition to video games available at retail stores, Nintendo also offers a variety of content that people can download directly to their systems. Nintendo adds new games weekly to the Nintendo eShop on the Wii U console and the Nintendo 3DS family of systems, the Nintendo DSi™ Shop for the Nintendo DSi system and the Wii™ Shop Channel for the Wii console.